Gallery of cosmetic make-up and facial visual art. Correction of emotions by means of cosmetic make-up is complex visual art which is fraught with stylistic mistakes, and consequently facial stylists and visage designers or image-makers should apply tools of emotional changes very accurately. Sad eyebrows and open eyes seem cheerful as the mouth expresses joyful emotions. 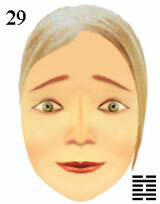 Sad eyebrows and joyful mouth seem cordial as eyes express open emotions. The joyful mouth and open eyes seem dismal as eyebrows express sad emotions. The person is sad because of ideas, but face has smile as feelings joyful. Desires are carried out contrary to sad ideas as if the person attains a happy end of sad history. tools of cosmetic make-up for complex facial art.